For other uses, see Quzhou (disambiguation). 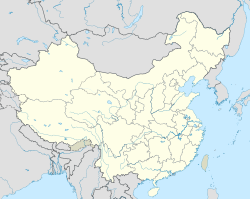 Quzhou (help·info)[a] is a prefecture-level city in western Zhejiang province, People's Republic of China. Sitting on the upper course of the Qiantang River, it borders Hangzhou to the north, Jinhua to the east, Lishui to the southeast, and the provinces of Fujian, Jiangxi and Anhui to the south, southwest and northwest respectively. Chinese Actress and Singer Zhou Xun is born in Quzhou. During the Southern Song dynasty the descendant of Confucius at Qufu, the Duke Yansheng Kong Duanyou fled south with the Song Emperor to Quzhou, while the newly established Jin dynasty (1115–1234) in the north appointed Kong Duanyou's brother Kong Duancao who remained in Qufu as Duke Yansheng. From that time up until the Yuan dynasty, there were two Duke Yanshengs, once in the north in Qufu and the other in the south at Quzhou. An invitation to come back to Qufu was extended to the southern Duke Yansheng Kong Zhu by the Yuan dynasty Emperor Kublai Khan. The title was taken away from the southern branch after Kong Zhu rejected the invitation, so the northern branch of the family kept the title of Duke Yansheng. The southern branch still remained in Quzhou where they lived to this day. Confucius's descendants in Quzhou alone number 30,000. The Hanlin Academy rank of Wujing boshi 五經博士 was awarded to the southern branch at Quzhou by a Ming Emperor while the northern branch at Qufu held the title Duke Yansheng. Kong Ruogu 孔若古 aka Kong Chuan(孔傳) 47th generation was claimed to be the ancestor of the Southern branch after Kong Zhu died by Northern branch member Kong Guanghuang. The leader of the southern branch is 孔祥楷 Kong Xiangkai. During the Second World War, Japanese troops used bacteriological weapons in Quzhou, spreading plague, typhoid and other diseases in Quzhou, as well as in Ningbo and Changde. As a result, between 1940 and 1948 more than 300,000 Chinese civilians in the area contracted the plague and other diseases, and an estimated 50,000 died in Quzhou alone. The prefecture-level city of Quzhou administers 2 districts, 1 county-level city, and 3 counties. The centre of Quzhou sits on a broad agricultural plain based on the Qiantang River. The river is known locally as the Qu River (衢江). It flows roughly southwest for 81.5 km (50.6 mi) and is flanked on both sides by hills. Almost all the rivers of Quzhou feed into the Qiantang system, which ultimately empties into Hangzhou Bay. The terrain is higher in the west and the east. The territory of Quzhou Municipality is made up of plains (15%), hills (36%), and mountains (49%). In the north is the Qianli Gang (千里岗) mountain range and in the west the Yu Mountains (玉山脉). The highest mountains, the range known as the Xianxia Ling (仙霞岭), lie in the south. The highest point in the city is at Dalong Gang (大龙岗), which rises to 1,500 m above sea level. 70.7% of the land is covered with forest. The rest is densely irrigated and farmed, producing citrus fruits, tea and mulberry leaves. Quzhou has a humid subtropical climate (Köppen Cfa) with four distinctive seasons, characterised by hot, humid summers and chilly, cloudy and drier winters (with occasional snow). The mean annual temperature is 17.31 °C (63.2 °F), with monthly daily averages ranging from 5.4 °C (41.7 °F) in January to 28.7 °C (83.7 °F) in July. The city receives an average annual rainfall of 1,705 millimetres (67.1 in) and is affected by the plum rains of the Asian monsoon in June, when average relative humidity also peaks. The frost-free period lasts 251–261 days. Winds along the Qiantang River valley are predominantly north-easterly and north-east-easterly. Occasionally typhoons blow in from the Pacific Ocean. With monthly percent possible sunshine ranging from 25% in March to 59% in August, the city receives 1,810 hours of bright sunshine annually. Lanke Mountain, 10 km (6.2 mi) southeast of the city proper. It features green peaks and clear waters, and the huge rocks on top of the mountain support a horizontal rock to form a natural arch, the Tiansheng Bridge ("Nature-Formed"). As of 2003, Quzhou municipality registered a population of 2578100 . The vast majority are Han Chinese (99.16%) but there are also small minorities of She (0.73%) and Hui, Zhuang, Manchu and Miao (together making up 0.1%). Most of the people in Quzhou are engaged in agriculture (2,035,100). The genders are roughly evenly split. Population density is 273 people per km². At any given time there are a handful of foreign (mainly European and Australian) teachers at the schools and university of Quzhou, as well as alleged but never seen Russian Military Personnel who work and advise at the military base. Quzhou is well served by both railways and highways. The city of Quzhou is a major connection hub between the three provinces of Anhui, Jiangxi and Fujian, with the Zhegan Railroad running through southern Quzhou and the Qu River flowing past northern Quzhou. A local saying goes: "Four provinces through Qu, it's the head of five roads" (四省通衢、五路总头). ^ In addition to the pinyin and Wade-Giles romanizations of the name given above, Quzhou also appears in historical accounts as Kyu-tcheou-fou and Kiu-tcheou-fou,  based on French transcriptions of its name and former status as a prefectural seat. ^ E.g. : An historical, geographical, and philosophical view of the Chinese empire: comprehending a description of the fifteen provinces of China, Chinese Tartary; tributary states; natural history of China; government, religion, laws, manners and customs, literature, arts, sciences, manufactures, &c (2 ed.). p. 83. ^ Thomas Jansen; Thoralf Klein; Christian Meyer (21 March 2014). Globalization and the Making of Religious Modernity in China: Transnational Religions, Local Agents, and the Study of Religion, 1800-Present. BRILL. pp. 187–188. ISBN 978-90-04-27151-7. ^ "Nation observes Confucius anniversary". China Daily. 2006-09-29. ; "Confucius Anniversary Celebrated". China Daily. September 29, 2006. ^ Thomas Jansen; Thoralf Klein; Christian Meyer (21 March 2014). Globalization and the Making of Religious Modernity in China: Transnational Religions, Local Agents, and the Study of Religion, 1800-Present. BRILL. pp. 188–. ISBN 978-90-04-27151-7. ; "Archived copy" (PDF). Archived from the original (PDF) on 2016-03-04. Retrieved 2016-05-03. CS1 maint: Archived copy as title (link) p. 14.; https://www.researchgate.net/publication/248653434_The_Ritual_Formation_of_Confucian_Orthodoxy_and_the_Descendants_of_the_Sage p. 575. ^ "Archived copy" (PDF). Archived from the original (PDF) on 2016-03-04. Retrieved 2016-05-03. CS1 maint: Archived copy as title (link) p. 5. ^ Thomas Jansen; Thoralf Klein; Christian Meyer (21 March 2014). Globalization and the Making of Religious Modernity in China: Transnational Religions, Local Agents, and the Study of Religion, 1800-Present. BRILL. pp. 189–. ISBN 978-90-04-27151-7. ^ Jonathan Watts: Japan guilty of germ warfare against thousands of Chinese The Guardian, 28 August 2002; Justin McCurry: Japan's sins of the past The Guardian, 28 October 2004. ^ "Quzhou Airport Official Website". Archived from the original on 10 March 2012. Retrieved 6 January 2012. Wikimedia Commons has media related to Quzhou.